There is no disputing Swedish pianist/composer Martin Tingvall’s huge popular appeal. Now a long time resident of Hamburg, he must have been rubbing his hands with glee following the success of his trio albums Vattensaga (2009) and Vagen (2011) which reached No 21 and No 1 respectively in the German Jazz Charts. Vagen also reached No 91 in the German Pop Charts. The success story continues with his latest offering which reached No 58 in the German Pop Charts after merely a week. Tingvall’s partners in his multi-national trio are Cuban bassist Omar Rodriguez Calvo and the German drummer Jurgen Spiegel. They are a tight well-oiled unit, the result of a working relationship that spans over eleven years. Tingvall learnt his craft from Swedish piano legend Bobo Stenson, tweaking his jazz sensibility to reach out to the type of audience that views pop and jazz as bedfellows rather than aliens. The successful blending of jazz and pop elements was of course the trademark of the late great Esbjorn Svensson, Tingvall’s compatriot exerting a powerful influence on the younger pianist’s musical language; but it is also clear that Tingvall has listened a great deal to Keith Jarrett. The funky country/rock/ gospel grooves, hooks and riffs may remind one of Jarrett but it’s not quite the real deal. In general, the Swede seems to lack the emotional depth of a Jarrett, Svensson or Stenson. Beat is eminently accessible but the music is far from challenging. Some of the improvisations don’t quite hit the mark and there’s something of the formulaic about many of the twelve tracks. I am sure that his fans are totally unconcerned about all this, but there again I am positive that they wouldn’t object to a flirtation with danger now and again. Despite these caveats, there are some memorable moments on the disc: the opening track, “Den Gamla Eken”, begins with a haunting diatonic melody which reminds me a little of the simple grace of Arvo Pärt’s “Spiegel im Spiegel”; but soon we are in Bruce Hornsby country-rock territory with its rollicking syncopated piano figurations. “Hamnen” seems to marry Elton John with Keith Jarrett, not such an unlikely union in reality since Jarrett’s tentacles have always reached far and wide (two of Jarrett’s greatest likes are The Beatles and Scott Joplin!). “Heligt” is the most heartfelt track of the album, Calvo’s bow used to great effect in the piano/bass unison passages, time momentarily forsaken for the ebb-flow of rubato. We are back to gospel/groove in “Pa Andra Sidan”. 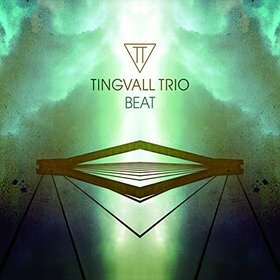 Here, Tingvall doesn’t go through the motions but keeps the listener on the edge of his seat with its unexpected tonal and rhythmic twists and turns. Beat may not be a great album but it is a pleasant one nevertheless, and it does contain some moments of inspiration to lift the spirits.